I’ve finally done it. I’ve moved a domain over to Google Apps for business. 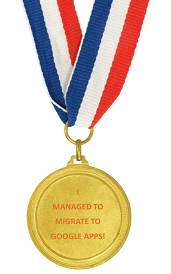 Google should give users a certificate, in fact a medal, for such an accomplishment. I’ve been saying for a while that if I was to setup a new company tomorrow, the last thing I’d do would be to buy an email server. You can’t just buy an email server – you also need to think about archiving, backing up, and anti-virus. And pay for someone to run those four servers. Google and Microsoft offer similar email applications that include variations of office productivity tools and then like. They also provide various levels of collaboration. My current ISP who hosts this domain wanted to start charging for email services, but the webmail client is just awful. I chose to move my email account to Google Apps (for Business) because I’ve always like Gmail, and reading the how-to-migrate documentation made it look simple. That was six weeks ago. There are  users at bradbox.com using Google Apps. If you don’t see the funny side, please read it again. And this is where I hit the major issue with Google. There’s no one to call when things go wrong. There’s not even a premium rate phone number. Or an email address. You need to rely on friendly users trawling through the Google forums helping people like me out. So I posted my message, and a few days later someone answered. He asked me to wait a little longer, and I did. He then said he’d spoken to someone at Google who said I need to wait a little longer. Fast forward a four weeks, and alas, I could register! The Google interface is still very technical. I know that I’m unlikely to break anything too seriously (no sniggering at the back please), so I played around with a few settings to get Mail up and working. It’s really not for the feint-harded though. You can see they’ve tried making it relatively simple with some help bubbles and wizards, but I doubt many people continued their migration at this point. One of the first things you need to do is prove that you own the domain (by adding a subdomain to the domain that was CNAMEd with a crazy, crazy long address). So I went through the wizard, and followed the wizard but I received an error. Again, a really big hurdle. I searched for the problem on the web, and many users reported the same problem – that long address was too long. I contacted my ISP, but they couldn’t help, or rather than didn’t want to. And I don’t really blame them – try walking into Tesco and asking them how to cook the stuff you just bought at Asda. Or walk into a Ford dealer and ask how the radio in your VW works. Hidden away was another method of verifying the domain by uploading a file to the web server. I went for that, and lo and behold, I had a verified domain. I now wanted to move my existing emails over to the new account. So I clicked on help. But after a couple of clicks, I was seeing 404 broken links. Two hours later, I decided to do it the old fashioned way and download the email from the previous ISP into Outlook, and then upload it again into Google. Actually, I still haven’t done it, because I’m in denial and don’t really want to see hundreds of email in my personal account – it’s bad enough at work! And that’s my story about moving to Google Apps. It’s far, far too complex. Now do you see why I deserve a medal? Either Google needs to start offering real end user support (a phone number), or enable other companies to offer IT support for the home, or start handing out medals. The migration of the email from to google apps are one of the toughest job to be handled .